Given my self-imposed weekend split between things for me and things for anything else, I spent the afternoon cutting out my Retro Flowers for the QAL – I don’t count this as a thing for me BTW, if I’m having to follow anything but my own patterns or whims ;o) Also, it already has a destination! 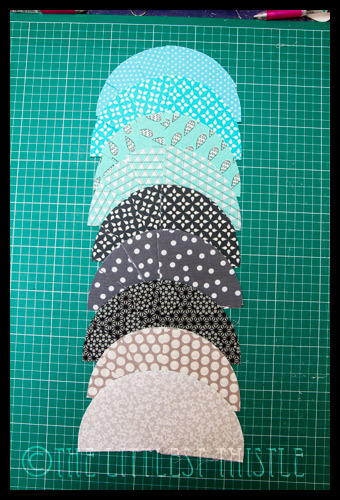 Anywho, here are the fabrics I chose. I’ll be doing a 3 x 3 baby size with these, with a grey in the centre and at each corner, and an aqua filling in the gaps. I totally mixed and matched my lines here, so I have different shades and patterns, but I think they work okay overall. I had ordered the pattern and templates waaaay back at the beginning of January as part of the Curves Class with Rachel at Stitched in Colour. As a class member, we got a discount on the pattern, and even though I had no idea what to use it for, I can never resist a good sale ;o) Happily, along popped Bianca from Sweet Diesel Designs and Megan from City Stitches with their Retro Flowers Sew Along recently, so I had an excuse to actually get going! Bianca’s become my own personal nag cheer leader (I think this is payback for volunteering to nag Allegory and Jen ;o) ) I’m a teeny bit behind, but I hope I can catch up in time to enter the comp. So far today I’ve cut out the petal pieces, so after dinner I’ll tackle the background and I might try sewing a little tonight, but tomorrow is mine, all mine My Precious, bwahahahahahaha. Your chameleon is too adorable. 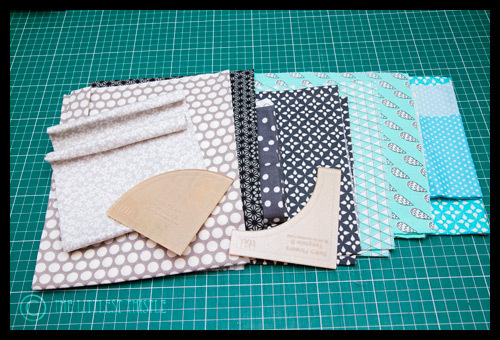 Love your choice of fabric for the Retro QAL. Thank you for testing my pattern 🙂 The dotted fabric for his body was a great choice. And I envy your fabric collection. Such beautiful greys and aquas. I am beginning to worry about your lapses into film and TV speak, are you sure you have been taking the right medicine for the tonsilitis?? Enjoy your day sewing for yourself tomorrow. Carl is fav. Of course he's shy, he no sooner was "born" and you go poking a camera in his wee little face. I would say he is looking a little sheepish! Good luck with your petals! haha payback from bianca! the chameleon is awesome, can't wait to see your retro flowers! Between you and Jen I'm really feeling the need to start some serious retro flowers production. That's the problem with a June end date – I feel like I have forever! Hi Carl, have you got over all those needles poking into you. I would hide if I were you. I like the fabrics you put together for your project. Will be fun to watch it come together! You'd better hurry, so we can all enjoy it with you. Seriously crushing on Carl. He does look shy.. I bet with a different placement of the black dot, you could make him all kinds of ways.. silly, suspicious, tired. lol That is a great pattern! Oh! He's too stinking cute! I LOVE CARL! Enjoy your "precious" tomorrow! Hoping it'll be "my precious," too! Carl is very cute! He reminds me of the chameleon in Eric Carle's book. Can't wait to see your retro flowers. Great fabric choices for the Retro Flowers. 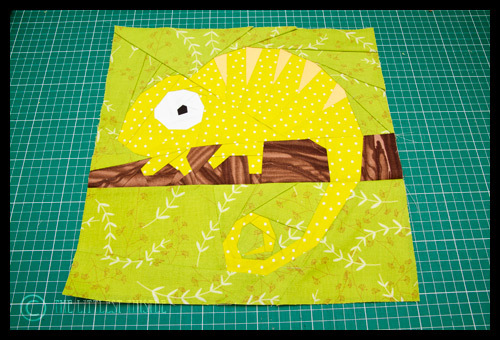 I was going to join in on this but life has taken over and I still haven't finished the paper piecing blocks yet or the NYB blocks I was going to make or ………. so I think I'll sit on the sidelines and watch this one. Cute Cute Cute Chameleon!!! Oh no I've started singing that Boy George song..Karma Chameleon.. sad I know. Nice choice of other fabrics too. If Carl ever needs a home….. I adore your retro choices!!! Sorry about the serial posting. I think my BUTTON GOT STUCK! Carl does look shy. I spelled Chameleon incorrectly in my last comment…oops! I like the fabric you have chosen for the retro. Chameleons are supposed to be shy. That's why they like to blend into the background! Carl is awffy clever. If I had that pattern I'd be sooo tempted to get the tartan out…. I love Carl! And I love Sarah's idea of a tartan Carl! !